Home/Home Solar Power/Why Do You Want A Home Solar Power System? In this post, I thought of writing some information for the people who are at the beginning stage of a home solar power project. A lot of people interested in using solar energy at home may be wondering how to design a cheap solar power system. But before you jump into any residential solar project, the first question you should ask yourself is why you want the solar system? Different people would have different answer to that question. Some people may want to reduce their home energy bill while others may want to get rid of it all together by living off the grid. Now, some people may want to have solar energy at home because they may be living in a remote area out in the country where it is too expensive to have power utility poles and cables pulled to their doorstep. It would make better economic sense to use power generated from a solar system. This is known as a standalone solar system. Another reason to have solar power at home is to reduce global warming. Some people are green activists and would rather use renewable energy than coal, oil or gas which has a large carbon footprint. Another reason home owners may want to use solar power is as a backup system. You may be living in an area where the power supply is unreliable and has constant energy outage. This is happening in places where the economic growth is faster that the infrastructure growth and the electricity supply has not caught up with the demand. When the power grid is overloaded, something has to give and that something is the power supply to your home area. A solar system can be used as a backup when the power grid is down. These are a couple of reasons I can think of why you would want a home solar power system. I am sure there are many more reasons why home owners would consider investing money on solar components. When you know the reason, now you can start to design the solar system based on your budget. If you have money to spend, you can engage the service of a professional solar contractor. If you are working on a shoestring budget, your only alternative is to build the system via a Do It Yourself (DIY) approach. Both approaches has it pros and cons. To make your decision, it is best to revisit why you want the solar system in the first place and proceed from there. Do you want to get started on a DIY home solar power project? 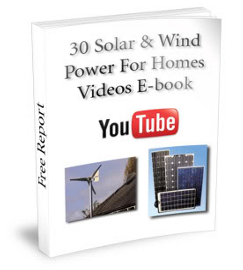 If you do, download a free copy of the 30 Solar and Wind Power For Homes Videos e-book. The e-book will show you videos on the parts and components required to setup a solar energy system and it is free to download. To download the guide, just click on the link below.